Yay! September is here which means cooler weather, Pumpkin Spice EVERYTHING and scarves and faux leather jackets! 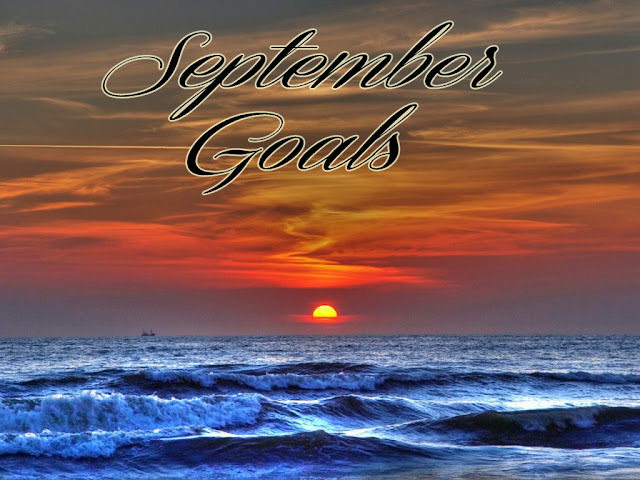 August went by in a flash and I did not accomplish any of my goals. This was my worst month yet. I don't know if I just got in vacation mode or the end of summer just made me lazy, but I definitely let August slip by without really doing much. Good thing a new month can mean a fresh start! - Get back into baking. This time of year it's all about gearing up for the holidays and I love trying possible gift idea recipes out this month so I want to bake at least 2 new things this month. - Get a backlog of photos. I say this all the time but it'd be especially helpful right now to stockpile some photos for the blog as the days are getting shorter and darker which means my window for pictures for the blog shorten. If I have a good stock on hand it would be helpful. - Make a different recipe every time I cook for the month. Note, I said every time I cook, which is not every day. But I'll admit when I do cook I get into a bit of a rut where I'm making the same dishes over and over. It's time to shake things up a little bit and maybe some of those recipes will feature in the blog. Perfect and I know this means you'll be baking some pumpkin goodies!!! ;-) Have a wonderful Wednesday gorgeous!! Oooh great goals, I love when the weather cools off so I can bake even more without sweating to death! I want to bake a bunch of goodies for Christmas, I'm so with you on that one. Great goals my friend, I can't wait to hear all about your adventures. XO! Please share your baking recipes I bet they are amazing! Good luck with all your goals my gorgeous friend!